Summer has been hesitant in arriving here in the Pacific Northwest. We’ve been blessed (eh?) with a wet spring, and it seems to be lingering, though as I write today the sun is just beginning to fade on this, the longest day of the year. Yeah yeah, I’ll probably be glad sometime in August that we got a nice, moist start to the dry season (yes, Portland has a dry season), but my drowned shell peas and slug-savaged bush beans in the garden do not have that kind of perspective. Innocent victims. Fortunately for our vitamin D-starved souls (and complexions), DG and I were lucky enough to have a chance to escape the chilly spring weather a few weeks ago with a quick jaunt to sultry Savannah, Georgia, where we got in a good dose of sunshine, humidity, and southern cooking. We had a native host who introduced us to family and friends, and showed us the sights and the hidden secrets – we even saw an alligator! Just walking around like he owned the place! Amazing. I’ve included a few culinary highlights of the trip at the end of this post. So, while summer has officially begun according to the calendar, the strawberry farmer I chatted up at the farmer’s market last week was more skeptical about the turn of the season. His berries were pretty gnarly-looking and he reported that he’s still got lots of green berries on the plants that he hopes will ripen if we ever get a sunny spell. Lucky for me, that means I haven’t missed the magic crossover of the strawberry and rhubarb seasons, so I still had a chance to meld their sweetness and puckery tartness in a crisp before the chance passed me by. I bought up a big flat of berries (gnarly or not, they still taste great!) for preserving their sunshine-y flavor in jam (at least I can imagine the sunshine), and used the remaining berries in the delicious dessert that I impart here to you. This is a really simple recipe that lends itself easily to different fruits, and can be prepared in a jiffy, if you need to whip something up for company or just have a hankering for a quick dessert fix. The crumbly topping – traditionally called streusel – can be universally used in any crisp recipe. Additionally, if you can find the right balance of fruit, sugar, flavoring (in this case, a squeeze of lemon and a touch of vanilla), and thickener (here: cornstarch) for the filling, you can toss this topping on any old fruity thing and it will be a crowd pleaser. Don’t be afraid to mix and match, fruit is very forgiving. And even if it doesn’t come out utterly perfect – perhaps it’s overly juicy or a little on the tart side – no one’s going to complain when you serve them ice cream topped with a warm, crumbly, fruity scoop of something. Everything we cook is a learning experience to make the next result one notch better. To make the filling, mix the rhubarb pieces with the 1/3 cup of sugar, and put it aside for about 15 minutes, giving it a stir from time to time. In another bowl, toss the strawberries with the 1/4 cup of sugar. 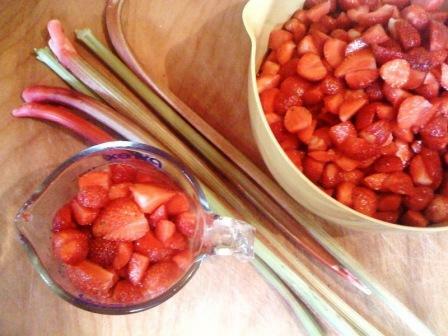 When the rhubarb has been sitting long enough to release some juices, use a slotted spoon to transfer the fruit into the bowl with the berries, and discard the remaining rhubarb juice (it’s bitter). Add the remaining filling ingredients, stir it up, and pour into your awaiting baking dish. To make the topping, cut the butter into chunks then combine with the rest of the ingredients in a medium-sized bowl, blending it all together with your hands. (You can also use a pastry blender or a couple of forks if you’re skittish about mixing with your hands.) The end result should resemble large crumbs. Lick your fingers. Yum. Sprinkle the topping over the filling, and bake for 30 minutes at 375°F. Without opening the oven, reduce the heat to 325°F and continue to bake for another 30 minutes. When the crisp is done, the fruit filling should be bubbly, and the topping nicely browned. Let it rest for about 20 minutes before serving. Make a batch of small, individual crisps by dividing the filling and topping between a set of ramekins or small baking dishes. These may take less time to cook, depending on the size, so keep an eye on it. Play with the spices in the topping. Substitute some of the fruit for another fruit you like, or one that is in season where you are. Just be aware that rhubarb is pretty sour to start out with, so you might need to adjust the sugar if the fruit you’re using is less tart. Eat it cold for breakfast with your preferred morning beverage. Reheat it in the oven (uncovered) at 350°F until nice and bubbly, and serve with a scoop of vanilla ice cream. Take a spoon to the fridge and scoop out a bite when you’re feeling peckish. That’s what I did. 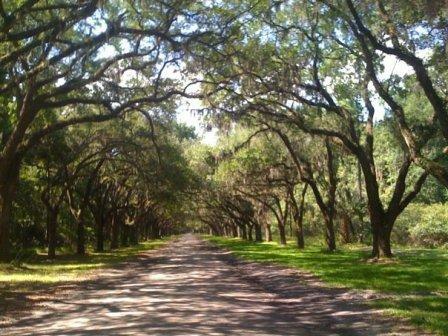 Savannah is many things: elegant, verdant, steamy, flat, historic, hidden, sultry, the list goes on and on. 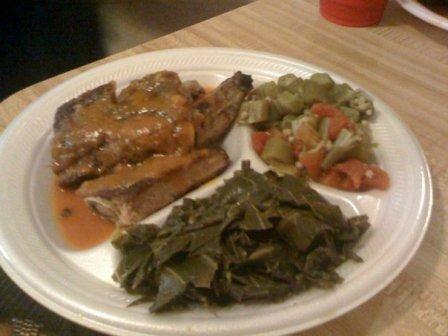 But the side that I most enjoyed was the tastiest one: the low country cuisine. Here are a few of the discoveries! 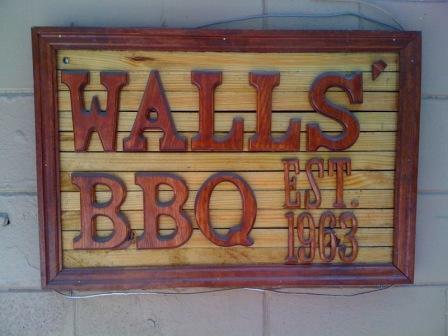 * Upon landing in Savannah after a cross-country red-eye, we headed straight downtown for an early lunch at Wall’s BBQ. We were the only people in the joint at that early hour and we got first pickings. My belly thanked me later for the tangy ribs, sweet okra, creamy mac & cheese (not pictured here), and wonderfully porky collard greens, all washed down with some very sweet, very cold sweet tea (this is as opposed to its counterpart, locally known as “unsweet tea”) with lemon. …we were ushered to a large table where we were seated family style with other guests. The table was already set with glasses of sweet tea and more than a dozen – I wish I had counted! – side dishes. Butter beans, okra, beef stew, white rice, black-eyed peas, collard greens, red rice with sausage, cornbread, biscuits, potato salad, egg noodles with peas, sweet potatoes, creamed corn, and on and on. 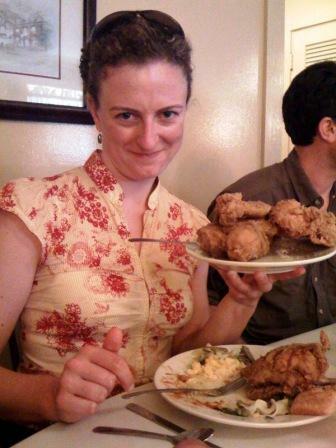 Then out came the platter of fried chicken. I have never tasted fried chicken that good, and I have never eaten so much fried chicken in one sitting. And then I ate a serving of banana pudding. I have no regrets. 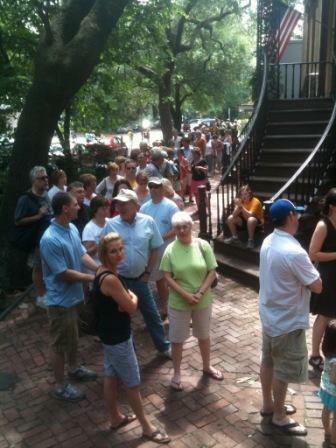 * Savannah has wonderful seafood! 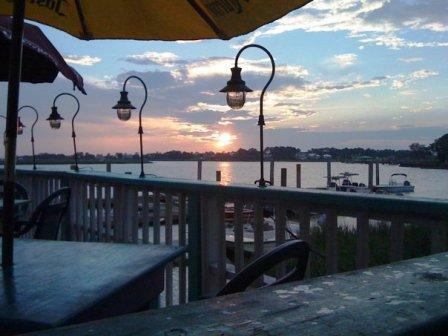 I ate my way through an entire pound of boiled shrimp at AJ’s Dockside Restaurant, and we enjoyed this stellar view of the water from our seats on the deck. * Our last meal in Savannah the afternoon that we left town was at Soho South Café. The food served to all eight members of our party was of astounding quality and creativity; I can’t say enough good things about this restaurant. For my entrée I had the classic low country dish shrimp and grits (to which they added a crab cake for good measure – no arguments from me), which was outstanding. 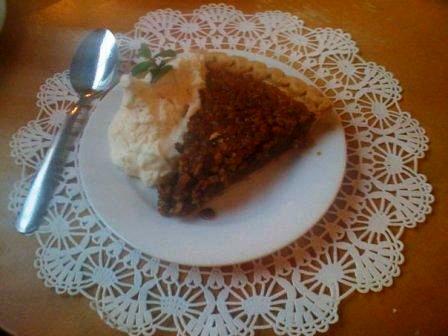 But the glory of all else fell away when I tasted their simple, unadorned pecan pie. I hesitated in ordering it because no one else was joining in the dessert course, but a little coaxing from my southern hosts convinced me to break down and order the pie. Thank you, kind hosts, from the bottom of my heart. I have had many-a-pecan pie in my day, and this was a different creature altogether. There was salty to balance the sweet, a perfect, flaky crust, and just enough chopped pecans suspended in the succulent filling. Truly, this pie rates among the best desserts of my life so far. Santa, please bring me this recipe for Christmas? 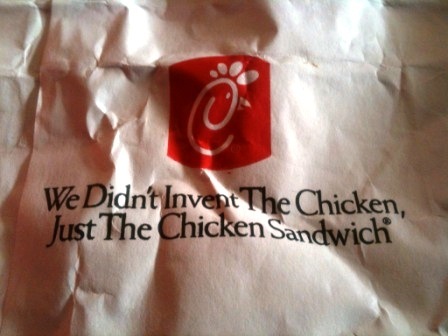 * Last, but not least, I was warned before even getting to Georgia that no trip to the south would be complete without a stop at Chick-fil-A, a first for me. Our time in Savannah was so jam-packed that we never had a chance to hit one of these joints, but I’d like to thank United Airlines for my perfectly-timed layover in Atlanta that afforded me the chance to try one of these crispy, pickley delightful sandwiches. A great send-off. This entry was posted on Tuesday, June 22nd, 2010 at 9:21 pm	and is filed under Dessert, Food, Recipe, Sweets, Travel, Vegetarian. You can follow any responses to this entry through the RSS 2.0 feed. You can leave a response, or trackback from your own site.